There at home where I could stay for hours. You thought I was trapped from within. And the sweetest haven for heart and soul. Ça a l'air tellement confortable et charmant. Do you glaze? If you do glaze, what colour do you use for the underpaintings? Can an Alla Prima be blended as to bring the effect that is seen in glazed paintings? Très belles lumières. À la première idée je file sur certaines toiles mais il y a une douceur étonnante qui coule. Il y a une jolie necesité à peindre. Très belles couleurs. Je suis agréablement surpris de passer du temps ici. J'espère bientôt pouvoir les voir en chair et en os. Amicalement, bel été. Le tableau est beau, le poème est beau et il illustre tout a fait le tableau... AH que dire si ce n'est que magnifique ? Franchement... Je suis totalement ébahie ! Et même époustouflé. It should be called Home and Fairies and also some Little People With Wings. Your work is breathtaking. Just beautiful. I felt like I couldn't look at your work without saying something. But yet, words can't capture what your work makes me feel. Wonderful, beautiful. Thank you for creating. Although I really love everything I have seen that you have done, I particularly love this painting. Very, very beautiful! Thank you for sharing your work with us. Its so weird as amazing as my own imagination goes nuts trying to work out this painting. 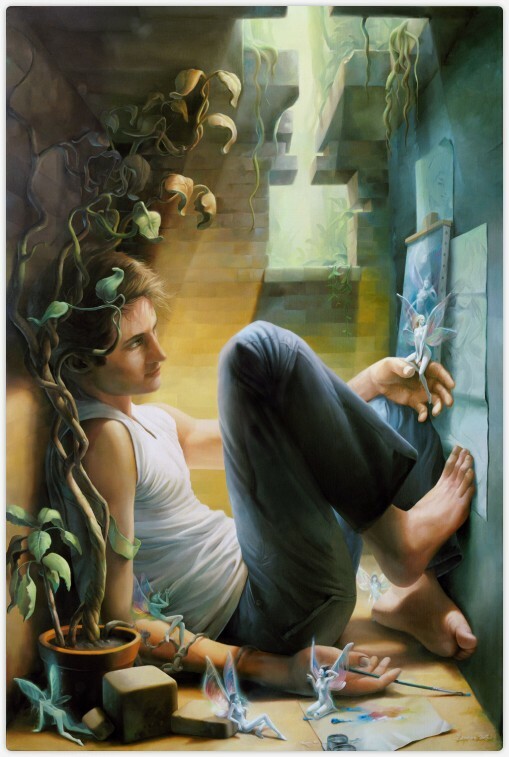 I started questioning why he's in such small room and if the fairies arrived before he started drawing them or is he drawing them as he sees them (that was quite easy to work out from his facial expression). Its just a brilliant work of art!! Its so rare I get this feeling with art. Hi Michaël! I was just wondering.. what is your favorite painting? And what painting do you find the hardest to make?? This is excellent. Props to you, I'm captivated. I avow .. I've mixed dried hypnotizer powder with my pigments... mean me ! Wow. The idea, the work, you are awesome at this! Keep on painting, you're doing the world a favor by painting! this painting is sooooooooooooo beautiful! so magic!!!! i have no idea about art, but this travels me... you are excellent!!! i wish i could give my hand to your magic hand man! bravo!!! you are so talented! This is the first of your work that I stumbled across on Deviantart and I think I must have spent over an hour lost in daydreams looking through your gallery. Your work is exquisite and truly captures the imagination. I love the tiny detail and the hidden stories in them. Thank you for your time and your little note! This one caught my eye on Deviantart the other day, and I noticed that once I began looking at it, I simply could not stop. The colors, the detail, EVERYTHING is simply breathtaking, and I think I have found a favorite oil-canvas artist :D Keep up the amazing work! And, even a bit late, I am very glad to be one of your fav oil painters! Thanks! The piece is really stunning. The way the light filters in through the dying vines is what really gets me- the coloring is amazing. I like the way the fairies glow without it affecting the color of the man's skin- it makes them more unearthly and majestic. The only criticism I can think of is that his right forearm and wrist are disproportionate in length. Hi Michael, I just discovered your work over on deviant while browsing, and can't believe I missed it for so long. I've been long awed by people who can use oil paint to this level of skill, but your works are unlike any oil paintings I've seen. You capture light in the same way digital paintings do, an incredible feat in my eyes given the digital medium is light itself. To say I find this inspiring is a gross understatement, you make me wish I had the ventilation, space and time to go back to working oils again. As a self portrait, this one caught my attention in particular, as even before I'd read the description, I loved the way it expresses what it is to be artistic. Mostly because despite the cramped setting the figure is curled up in, the overall feel of the piece is one of quiet contentment, not discomfort, as you might expect. It is often an enclosed world, alien to those who've never been there, being a painter, but I couldn't be happier than when I'm closed in its walls. It brightened my day. So thank you. Sadly, no. I'm still in the "aspiring" stage of things. I'm flattered you asked, however. I found this painting browsing Deviantart and think it is truly inspiring. Much as I would love to be a visual artist, I have neither the patience nor the skill, and content myself by writing instead. As a writer, I enjoy the endless stories your paintings contain. Keep up the great work. Even though they are usually built upon a story of my own, when I spread an image to the world I try to make it as free for interpretation as possible, giving only clues, or surreal words that encourage the imagination. Inspiring might be the most rewarding adjective to welcome my work. Can your writings been seen somewhere, by any chance ? I founded this link at your deviantart gallery. I love it! And I love those words you wrote here about the painting process. I totally agree with you- relaxing and irreplaceable! Ahh.. except for the nose and feminine lips, truly a masterpiece.. Thanks for sharing your divine creation.. The nose looks like mine, but the lips indeed, they have a feminine feel. I had never seen it under this angle. Thanks.. and it's not divine, just .. daydreaming a little. This was the first painting I saw by your hand, and it still amazes me, like all the others do as well. I absolutely love your style and use of light and color. You are one of 2 people who made me want to learn to draw/paint. To my own amazement I can actually (and suddenly) produce something half decent , but it's training and patience only, I definitely lack the talent. Still it is incredibly FUN and motivating. Thank you so much for showing some of the steps of how you create these! I hope to come close to your work someday ( and really, 1 km from it is close enough ). I think your work would be perfect for fairy tale books - I know I would have loved to stare at these pictures for ages when I was a kid, letting my mind take me places. And now, at 27, I'm staring at them for hours as well, only my imagination has lessened a little with age. I love this. Your (character?) looks so lifelike and realistic, but the presence of the fairies give it a very romantic and fantasy-world-like feel. Somehow I feel that it has a deeper meaning but I'm taking it as it is. Wonderful, interesting and imaginative. I have experience with using traditional medium (watercolor & pencils mostly) but I let it go stagnant. I'm trying to pick up and start again. your works are amazing. I've been looking at them for a while. you have such great talent. your painting say a lot. i appreciated them :) its nostalgia, i miss my fairy days being a little girl. Quel enthousiasme! ;) La peinture à l'huile peut faire de belles choses, si on lui accorde un peu de temps; je suis sûr que tu pourras en faire autant. This is an extremely beautiful piece for lack of better words. It's extremely realistic, even with the chicks with wings in there! I love how you showed the steps of thought and preparation that went into this painting. I'm an aspiring artist (hobby wise, anyway), an I love to see what others have come up with while using tradtional media. Your progression leading up to the painting will definately help me, as I paint more. Thank you for sharing this artwork with us! I really love this picture. You're great! Just be patient.. I'm so desperately slow! ...Tout simplement... Waw... C'est... C'est vraiment magnifique, à en pleurer. Je trouve que vos créations sont tellement belles, tellement fantastiques, il n'y a pas de mots pour les décrire. La précision, la finesse, le doigté, les couleurs, les attitudes, tout est parfait ou presque(car prétendre atteindre la perfection, pour quiconque, me semble un peu orgueilleux). En tout cas, merci, merci de créer des choses aussi belles. Et merci de les faire partager, vous avez égayé ma journée pourtant des plus sinistres, continuez ce que vous faites, et j'espère qu'un jour vous serez reconnu et nommé parmi les plus grands, vous le méritez! Bien sûr, et heureusement, que ce n'est pas parfait; la perfection c'est surtout tellement ennuyeux! Je suis touché aussi par ce message. Pour ma part la peinture égaye et donne une raison à ma vie tout entière. Pouvoir transmettre cette passion est une vrai chance. Merci à vous et bon courage! Enfin, j'espère ne pas trop en avoir dit et ne pas paraître..peut importe quoi! Mais je vous admire! Bravo! Tous ces mots, c'est beaucoup trop, merci :) C'est vrai qu'il y a de l'amour, mais ma vie réelle est autre. La peinture est une amante, aurais-je le courage un jour de tout abandonner pour me consacrer à sa passion? Your work is very beautiful. I'm a young artist, and so far I've only worked with pencils and paint. I don't really have the desire to use computers at all. However, I notice the majority of today's young artists, actually prefer computers. It's inspiring to see someone who is so talented, and still does it the old fashioned way. Beautiful, beautiful work. Computers certainly bring out many possibilities and allow to create faster, which is perfect for illustrators who must respond to tight deadlines. But they also lack soul. I don't think you miss anything by not using them; traditional medium involves the whole of you, to tame it you have to stay humble and true. For the sake of Art these are great values.